The Best of Teacher Entrepreneurs III: Back to school rescource and chance to win! I am so excited about this Back to School rescource! It contains as much (or more) as you could possibly want to help get your classroom jitters out of the way, introductions made and pencils in motion! These no-prep printables are a perfect fit for any classrom 3rd-6th! 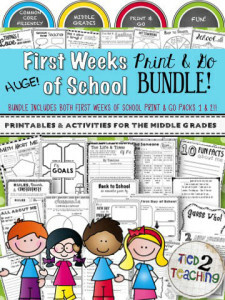 AND, as promised, please check out my facebook store for a chance to win my First Weeks of School printables for free!